Walk up. Take a stance. Swing. Re-enact 17 times. Members of the Georgia State men’s golf team complete those instructions 18 times every round they compete in. As repetitive as moves in other sports are, they pale in comparison to the exactness required when swinging a golf club. Whether the distance is short or long, a player is moving more times than not when they are shooting a basketball and throwing a football. A golfer never moves. The golfer has been remote during each swing the athlete has ever taken during their career. Swinging is the last step of the instructions a golfer follows. The first step is approaching the tee and placing the ball. From that point moving forward, a golfer’s mind can begin to race all the wrong places until after the swing. If junior James Kyles was to use a number four ball out of the set, his mind would take him to a dark place. Twelve balls come in the pack of balls James Kyles uses. Three balls are identified with a “1” on them, three with a “2” on them and three with “3” and “4”. The balls are identical and consist of the same make-up except for the number printed on them. However, Kyles’ refuses to play with the number four balls. Although Kyles says he’s gotten away from believing in superstitions, he will keep abiding by this one. He plays good rounds with the number three ball, and it’s what he typically uses in tournaments. Kyles still takes some of the best advice ever given to any athlete. The nugget of wisdom is simplistic in its rarest form—don’t think, just play. A successful golfer is technically sound in his form. The slightest misplacement of a knee, hip or an elbow can stir up a heap of issues, sometimes hard to identify. Having the same process before hitting the ball can eliminate the chance of ruining a swing. “I have a very set routine. I take three practice swings before I get into [position for] my shot. Then I take two looks at my target once I get over the ball. Then I wiggle once with my feet and then I go.” said Nick Budd, a junior from Woodstock, Georgia. “First in my setup for a full swing, I put my left foot behind the ball every single time so I know where I’m aiming,” said Kyles. Kyles began that routine to help with his aim the summer before enrolling into Georgia State. Other teammates have a detailed routine they know like the back of their hands. Herrmann felt that he should give a disclaimer before revealing whose reproduction and passion for perfection he admires. He did so because his influence is clearly the best golfer since the turn of the century—Tiger Woods. Woods was arguably the most accomplished golfer in history during his prime, which is much longer time than most greats. His work ethic drove him to win a PGA Tour event during four consecutive years, an accomplishment no other golfer post World War II has accomplished. Woods did it twice. Georgia State’ men’s golf team owns a decent work ethic as well. Herrmann says he and his teammates record one another to review their swings. They can give instant feedback and offer constructive criticism because they are a tightknit team. “We work well together. We all support each other and it’s a lot of fun to be out there with the guys,” said Herrmann. With improvements upon the strong performances they have put together thus far into the season, Herrmann believes the men’s team could make another deep postseason run and possibly the NCAA Tournament. Severin Soller, who transferred from Mississippi State, was not on Georgia State’s Sun Belt Conference winning-team last season, but is fitting in nicely with the returning champions. The title won in 2017 was their second title since the 2014 season. Soller was named the Georgia State Student-Athlete of the Week after his one under par finish (t-4th) led the Panthers to a second place finish two weeks ago at the Autotrader Collegiate Classic. The first of his two one under par finishes came during the Bridgestone Stroke Play, his debut for the Panthers. He was the only player in the 45-player event to finish under par. “Ever since I’ve been here, we’ve really struggled in the beginning of the season, which puts our rankings not where it should be,” said Kyles. That has not been the case this season thanks to dedication and performances from Herrmann, Budd and Kyles. They aren’t the only Panthers to shine since play began in the fall. Egill Gunnarrson also shined at the Bridgestone Stroke Play, tying in sixth-place at four over par. Herrmann’s twin brother, Alex Herrmann, has played exceptionally well. 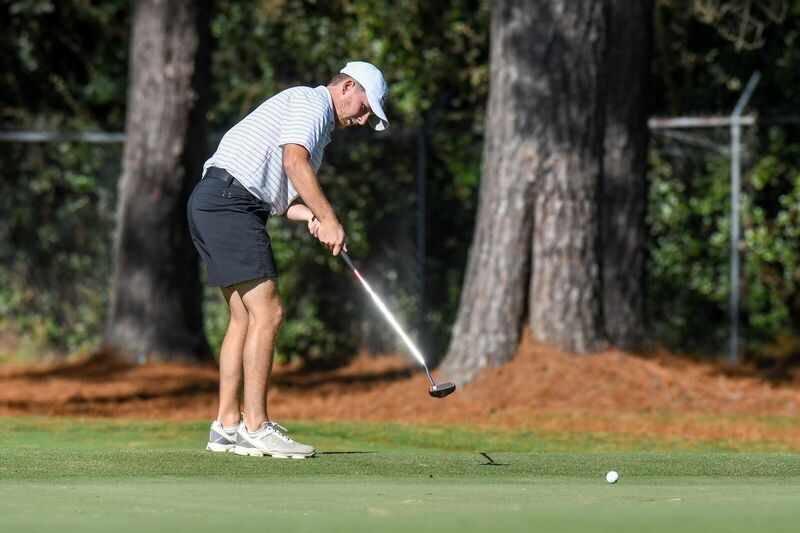 During the last round of the Maui Jim Intercollegiate, Max Herrmann shot three under par, to finish the event tied for tenth at one under par.